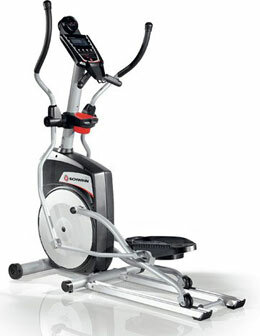 The Schwinn 431 Elliptical Trainer provides a quality elliptical trainer at a discount price. The 431 model is ideal for your home gym and for fitness enthusiasts of any skill level who want a low impact workout. The Schwinn 431 Elliptical Trainer can provide an effective cardiovascular workout by combining upper and lower body flexibility and coordination into one impact-free motion and is easier on your joints. Regular use on elliptical trainers will increase heart and lung capacity while improving your health and burning calories. Schwinn Trainers use 16 levels of Magnetic ECB (Eddy Current Brake) resistance. ECB technology has the advantage of no friction, reliability, little to no maintenance costs, and quiet operation. ECB magnetic resistance is usually only found on higher end elliptical trainers and is the best form of resistance for these machines. A 26 lb. flywheel provides for smooth strides. Features include BioGlide motion technology for a comfortable and natural 18-inch elliptical stride. Keep cool with the built-in 3 speed fan. Grip heart rate monitoring on handlebars provides your cardio progress on the LCD screen. Nineteen (19) workout programs: three heart-rate controlled programs, a calorie goal program, a time trial, a fitness test, 10 profile programs, two custom programs, and a manual option. Water bottle holder. Transport wheels to move your Elliptical Trainer. Treadmill Warranty: Frame – 15 years; Electronics – 1 year; Parts 2 years. Smart-Review Commentary: The Schwinn 431 Elliptical Trainer is a top rated trainer (by consumer and professional reviews). What you get is a well built heavy duty training machine (up to 300 lbs. user weight), that has many features of more expensive elliptical trainers. Upgraded features include 19 workout programs, 3 speed fan, and a new backlit LCD display. Several reviewers have commented that this model runs smooth and quiet, and is low impact on the joints. The Schwinn 431 has ECB magnetic resistance (the best type). It has an 18-inch stride. Schwinn is a leader in low cost elliptical trainers . For Elliptical Trainers, the 431 a great deal for the money and is a Smart-Review Top Pick.